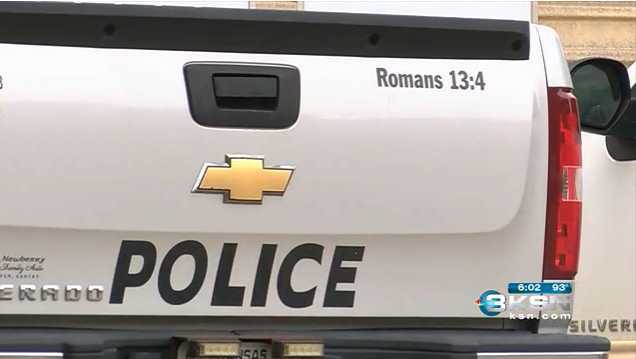 HARPER, Kan. — A police department in Kansas recently removed a Scriptural decal from a patrol vehicle after receiving a complaint from a professing atheist group. FFRF sent a letter to Chief Doug Murphy to urge him to remove the Bible decals. “It is inappropriate and unconstitutional for a government entity to display such a decal on its property because it displays a preference by the HPD—and by extension, the City of Harper—for religion over non-religion and Christianity over all minority faiths,” the correspondence read. The organization also took issue with the selection of Scripture. Following the issuance of the complaint, Harper Mayor Scott Blubaugh told local television station KSNW that he contacted the city attorney and asked him to determine whether the decal will need to be removed. But some area residents didn’t find the matter to be a big deal. On Tuesday, Chief Murphy replied to FFRF to advise that the decal had been removed. “The Harper Police Department has removed the decal ‘Romans 13:4’ from the city-owned vehicle it was on,” he simply wrote in his one sentence response.